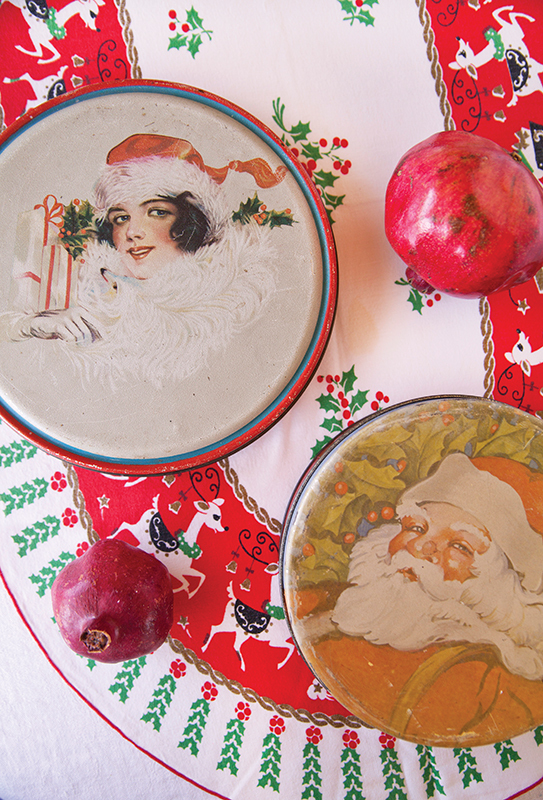 Festive vintage kitchenalia is a great way to spread a little Christmas cheer to the most-loved room of the house. Retro Christmas décor and vintage Christmas kitchen collectibles are about more than cute treasures put on display. These finds conjure up memories from childhood and happily deliver a sense of nostalgia that no big-box store can provide. To bring this cheerful sense home, add a little spice to your kitchen with holiday décor from celebrations past. Need Help Dating Your Wilendure Tablecloth? The “e” at the end of the company’s name was added in 1958—making rough production estimates easier. Beginning during the Great Depression, holiday tablecloths were mass produced and marketed as an inexpensive way to add cheer. These “lunch cloths” quickly gained popularity, thanks to their countless patterns and low cost. Through the 1970s popular manufacturers included Simtex, Startex and Wilendure. Since many of the vintage tablecloths available no longer have tags or their printing has long worn off, many collectors estimate the age of a tablecloth based on its size and art style. Until the 1950s the most common tablecloth size was 52 square inches. Rectangular tablecloths approximately 54 x 64 inches were introduced in the 1940s, and 60 inch round cloths stole the show in the 1960s. Longer lengths, such as 88 inches, are highly valuable and difficult to find. For help determining age based on art style, compare the tablecloth’s pattern to dated vintage Christmas cards, or talk to a textile or antique dealer. 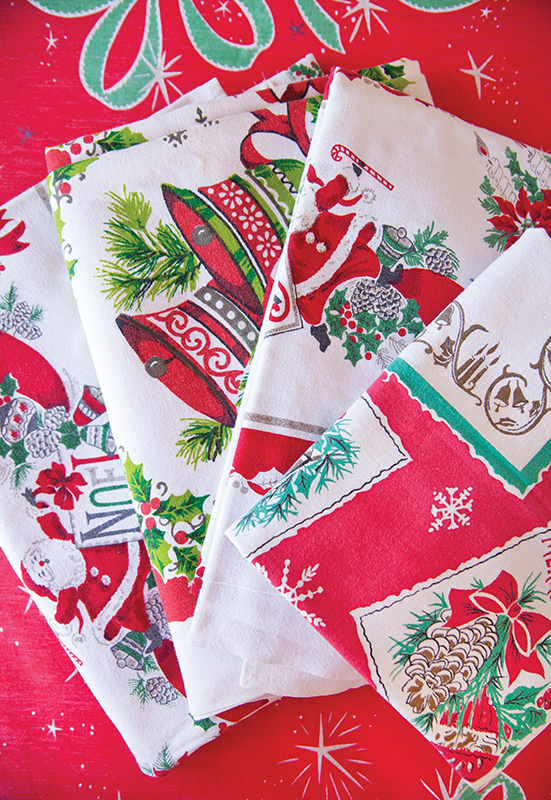 Despite era or worth, tablecloths are great vintage Christmas kitchen collectibles and carry with them a cheerful sense of nostalgia. While difficult to find without stains from holiday dinners past or worn from countless uses and washes, these linens are a seasonal staple for the vintage collector. The Iconic Tom and Jerry Drink Set Adds Retro Appeal. Other patterns from Hazel Atlas include “Auld Lang Syne,” “Currier and Ives” and “Colonial.” All printed in red and green on milk glass, these sets can be easily found and average $50 each. Delicate porcelain sets and iridescent glass varieties, such as those produced by Fire King, are slightly harder to find. Care for a Tom & Jerry? Cold winter nights call for a warm beverage—but before you reach for the hot cocoa or tea, consider the Tom & Jerry. Originated in the 1800s and popular through the 1960s, this drink, as well as its bowl and mug sets, is regaining the attention of mixologists and vintage collectors alike. 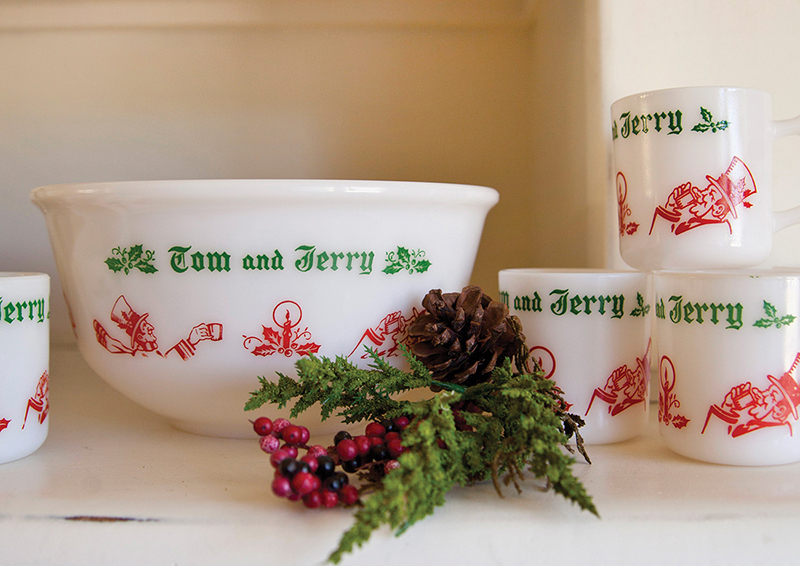 Typically served with a ladle out of the bowl and into petite mugs, these sets come in a wide variety of patterns—one of the most popular being Hazel Atlas’ “Christmas Carol.” Depicting top hat-wearing drinkers, this milk-glass set shares one thing in common with all Tom and Jerry sets: it bears the drink’s name. While Hazel Atlas preferred old English script to label their four-drink-set patterns, other makers opted for simpler designs such as creamy off-white mugs with gold script. Cellophane was not used in packaging food in the United States until 1912. Waterproof but not moisture proof, the product’s popularity didn’t rise until 1927 when the moisture problem was solved. Whether filled with treats as a small Christmas gift, stuffed with sweets as a party favor or used as a clever alternative to a typical gift bag, vintage cellophane bags are as merry as can be. Often tucked amid countless online listings or in catchall baskets at antique malls, cellophane bags are just quirky enough to be a good inexpensive buy. 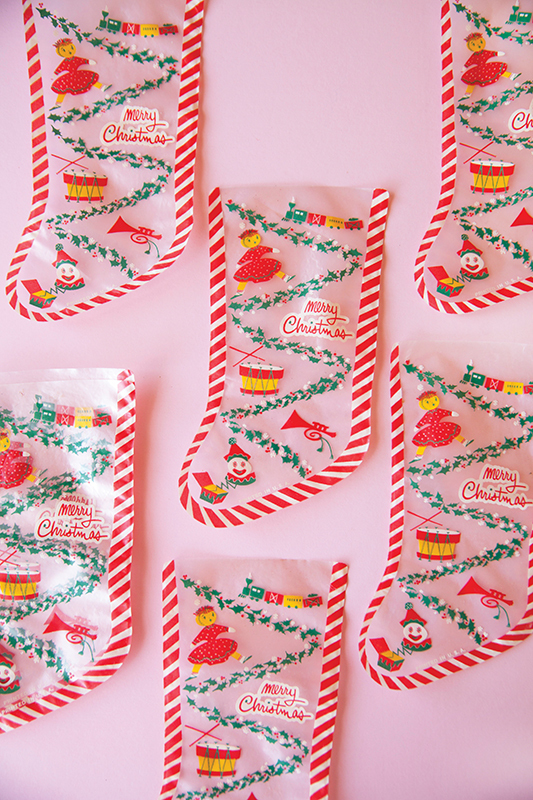 Their fun patterns and retro designs are just as cute this holiday season as they were originally—and so is receiving a goodie bag filled with Christmas treats. Santa and snow-filled scenes are by far the most popular cookie tins. Many carry a brand name, such as a soda or cookie company, or even the year. Christmas is the season for cookies. From gingerbread men to sugar-cookie snowflakes, this is the time of year when rolling pins, cookie cutters and tins get the most use. Turn to retro cookie cutters for iconic shapes with added charm, but if your cookie cutters are rusty, retire them to decorative accents. A strand of ribbon turns them into charming ornaments for the tree—or create a kitchen-themed wreath for over the sink. Let them dangle from cup hooks, create a small cluster to hang on a cabinet knob or display in a vintage mixing bowl. Vintage cookie tins are classic vintage Christmas kitchen collectibles and make for festive and unique gift giving. Fill with fluffy tissue paper and stuff with cookies, candies and miniature cakes, or surprise the recipient with a nonbaked good. With a wide price range online, vintage cookie tins are best picked up in local shops. Find one you just can’t give up? 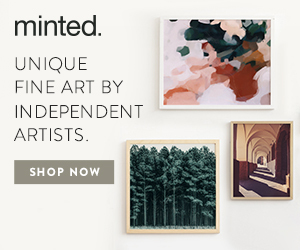 These treasures make for great storage for ornaments and other fragile decorative items. 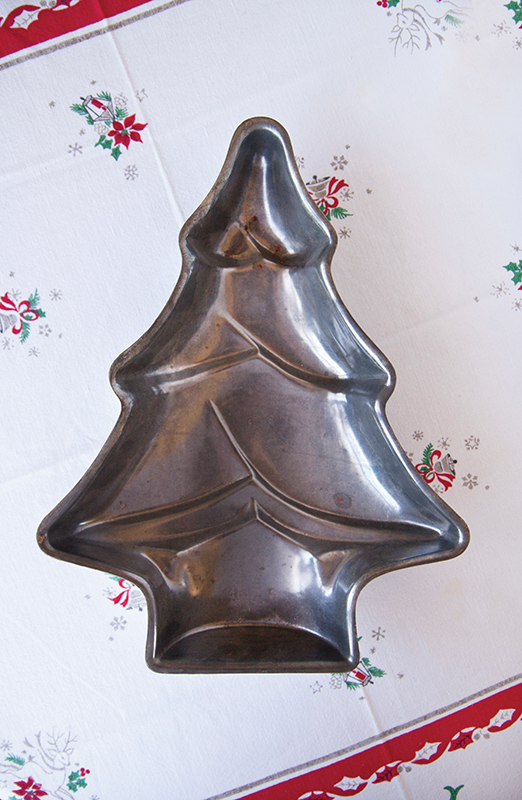 Use vintage cake molds as decorative objects on open kitchen selves or in counter-top vignettes. There is something special about walking into a Christmas party and seeing a tree-shaped cake proudly displayed on the dessert table. Iconic holiday shapes such as snowmen, Santa, presents and gingerbread men have long been turned into cakes because, quite simply, they’re charming. While copper cake pans are often favored thanks to their glistening color, tin varieties still have plenty of appeal. The Victorian era saw the rise of molded foods, especially meat dishes, while in the 1950s gelatin desserts and cakes cornered the market. 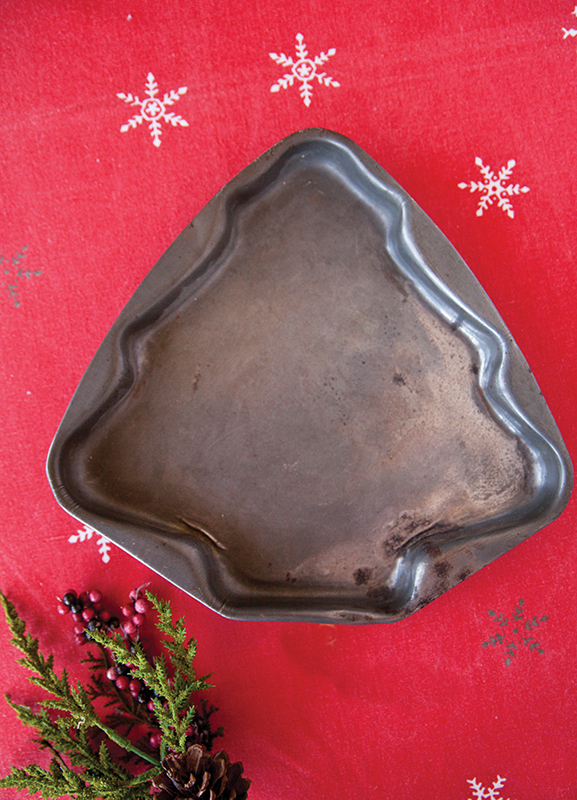 These pans became staples for retro holiday celebrations and are now collectible items. If frosting a Santa face feels too labor intensive, simply display a collection of cake pans in the kitchen as wall art, or center your favorite in the middle of a wreath. 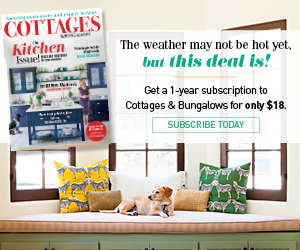 Craving more kitchen collectibles? Read up on depression glass and cubist glass.